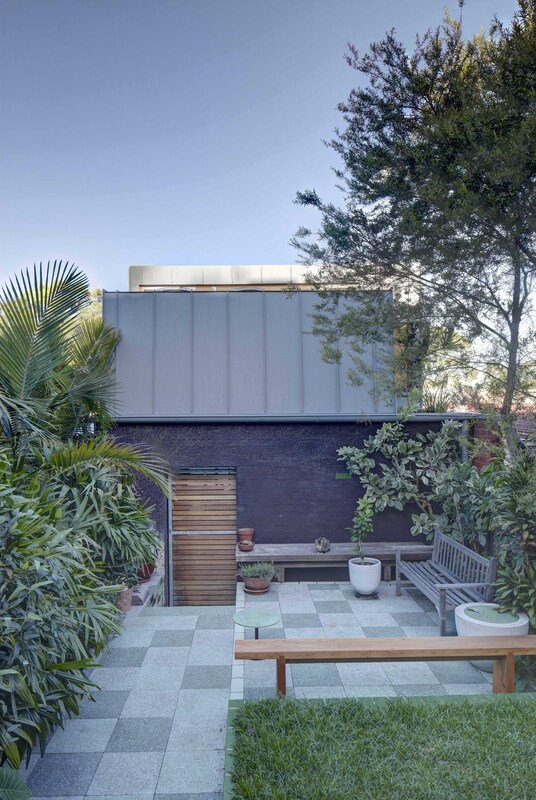 An intimately scaled studio addition on an inner Sydney laneway site. As issues of population growth and land shortages become more broadly discussed, architects are increasingly looking for innovative ways to enable smaller scale living. 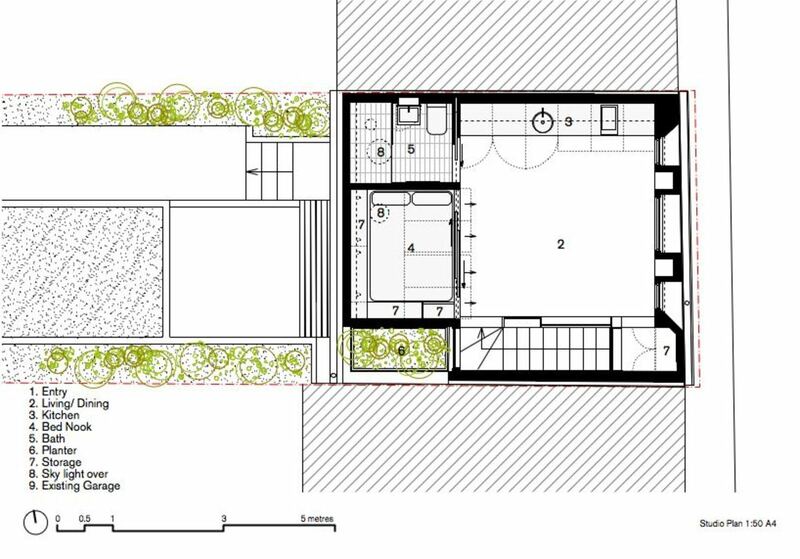 McGregor Westlake envisions laneway living as something to be excited by. Laneways can often feel like leftover space, but as laneway additions become their own typology, these spaces have begun to feel more vibrant. 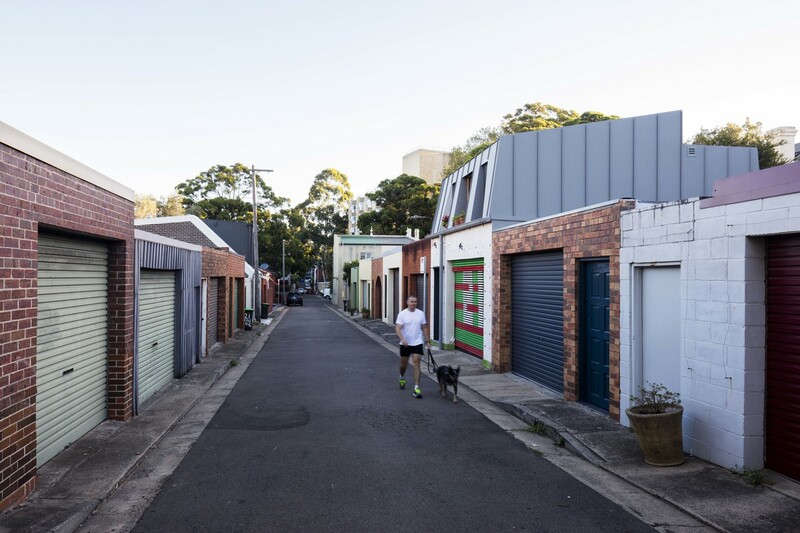 Unhappy with the current standard of laneway additions, Lead Architect Peter McGregor set design goals including being a good citizen, a good neighbour, and more practically, maximising the building envelope. The maximum envelope within regulation was achieved through the mansard roof form, which allowed the most efficient use of interior space. Minimising visual bulk and overshadowing, along with direct street engagement tackled the more socially conscious goals. Placing the stairs on the southern boundary allowed sufficient space to climb up to the second storey, and minimised overshadowing to the neighbour behind. Coming in at a budget of approximately $150,000, the project proves itself as a prototype for comfortable and cost effective living in high density contexts. At just 25m2, the laneway studio project by McGregor Westlake is a super compact addition to an inner city dwelling. The architects were their own client for this project, and hope to stimulate the discourse on small scale living in Australia. The tight laneway site is located in Redfern, Sydney. Utilitarian aluminium sheeting was used to clad the entire exterior of the project. The robust and unifying material clads walls, the roof, gutters, and downpipes. The interior of the laneway studio is designed to contrast with the urban setting of the laneway. 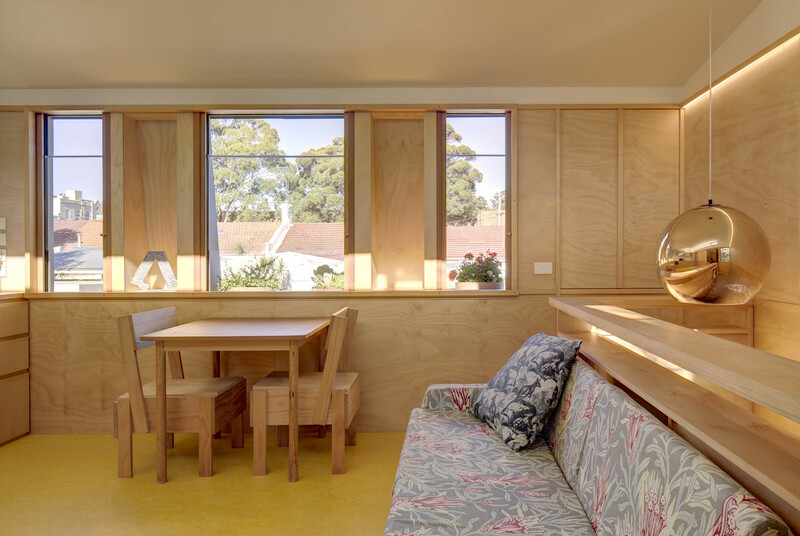 Warmth and nature were conveyed through the predominant use of hoop pine. The honey coloured timber was used in many forms, including solid timber, veneers, and plywood. 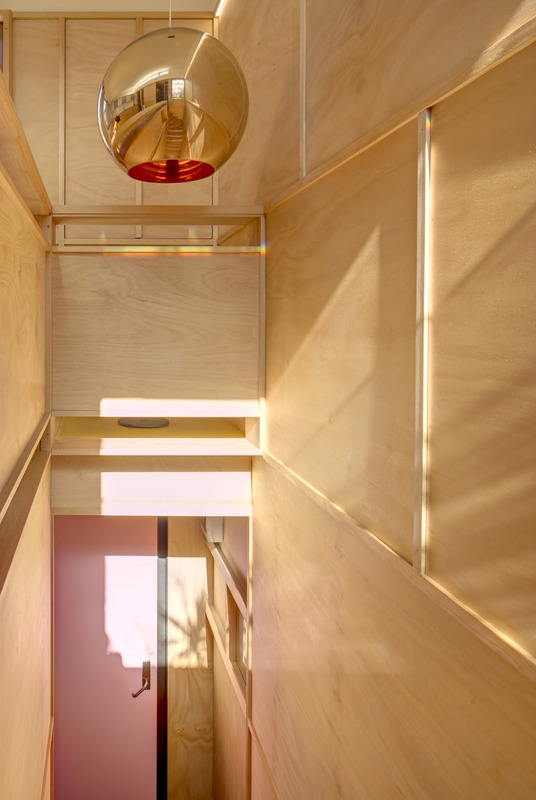 The diverse use of the timber meant that the entire interior, up to a 2.1 metre datum, could be unified through colour and material. The singular material use and clever planning restricted wastage of the resource. 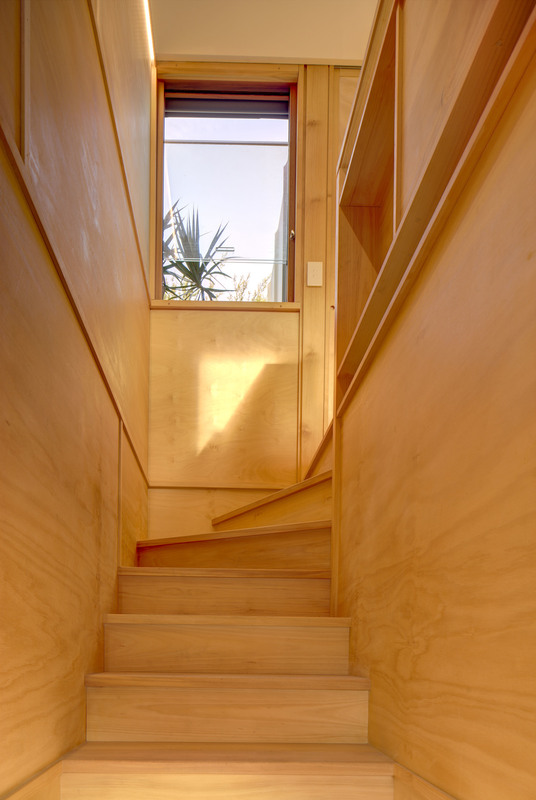 Stairs, wall linings, joinery, sliding doors and window sills all utilise the hoop pine. The interior reads like a piece of joinery, carefully detailed and built by a joiner/carpenter to maximise interior space efficiency and create a spacious feel in a tight zone. A 900mm datum forms an order to the room, hosting the balustrade, bench tops, window sills, and sliding door mid rails all at equal heights. Several layers of oil were applied for wood finishes, with hints of various artists pigments being mixed in the oils to create subtle variations in hues throughout the different areas of the space. White pigment was used between the datum heights, and a green tinge offered a cooler bedroom hue. Dormer windows allow panoramic views over the laneway and city beyond, while high sills mean that privacy is still maintained within the building. 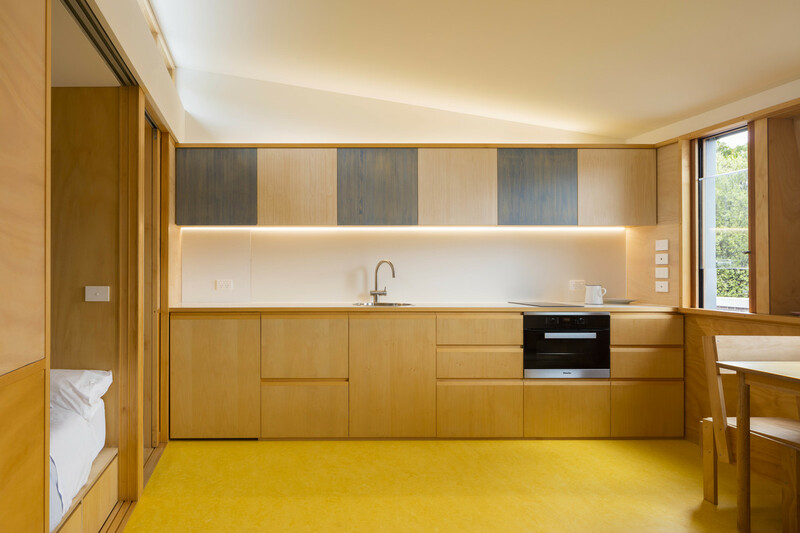 Internal lighting recesses neatly into solid timber housings, furthering the warm glow to the interior timber. 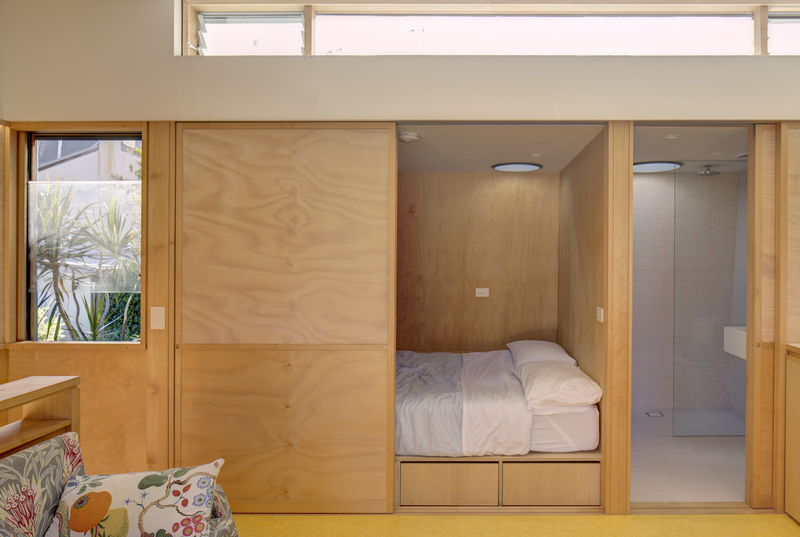 A clever hideaway bedroom nook slides away behind a plywood door, and features built in storage that uses every inch of the tight space. The bedroom, along with a bathroom, are nestled at the back of the structure, with a lower roof height. 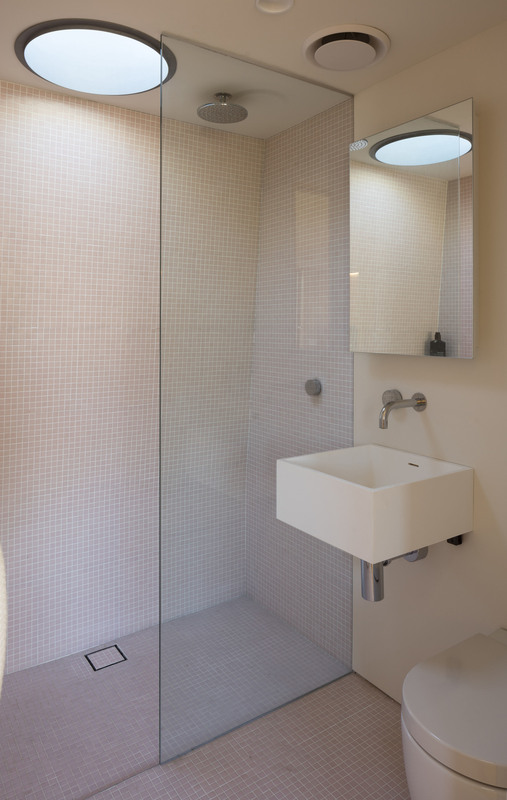 Clerestory windows rise above the nook to allow ventilation and precious light into the main space. Three types of tables, designed in response to agile working trends, feature certified timber and a silhouette that changes at every angle. The Murray Grove Tower was built almost entirely out of CLT, without the use of beams or columns.